The history of Goblins in mythology is rich, fascinating, and not what I plan on talking about right now. 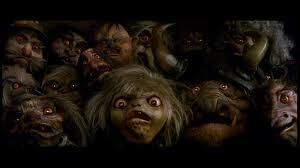 I probably first became aware of Goblins in 1986 with the movie Labyrinth. I don't recall ever feeling any particular way about them at the time. I think I just sort of took them at face value with sort of a "Sure, that makes enough sense, I suppose" attitude. I think it was probably 1994 by the time I noticed Goblins again. I saw them frequently while playing the new game Magic: The Gathering. They were very different from the ones that I had seen before, but were still unarguably quite Goblin... whatever that was. I then learned about D&D Goblins. Later on I started LARPing, and they had their own unique Goblins. These creatures were the first example I ever noticed of creators drawing upon a common mythos and interpreting it differently, but still staying true to the identity. The interesting thing is that there is no one Source of Goblin. The entire idea is one that we're all making up together and we just know when it's right. In my creative writing class, someone wrote a snippet about Goblins preparing to ambush a couple of travelers. It was meant to be an example of building tension. The teacher: Why are their swords rusty? Me: Goblins aren't known for their maintenance, they're scavengers. If their equipment breaks down, they'll just steal new stuff. Teacher: Well, if they're scavengers, maybe you could have them use old farm equipment as weapons. Me: Sure, if it was their first time out, but the first people they're going to ambush would be people with better weapons. Girl Next to Me: Wow, you sure do know a lot about Goblins. Me: Well... yeah... I do. Thing is, I didn't even wait for the author of the piece to respond. I started reflexively talking. Somewhere along the line I became so intimately familiar with Goblin Lore that it just became natural. I think one of the reasons that these things have fascinated me for so long is that they have severe weaknesses, the most of any fantasy creature. The fun part is that they have strengths to make up for each of them. Weakness: A Goblin is pitifully weak. A single one could be overwhelmed by a surly child. Strength: There is no such thing as a Goblin. They have a habit of overwhelming their foes with sheer numbers. Weakness: They are cowards. When intimidated, they will scatter like bugs. Strength: They are vicious. If they keep their morale up, they will gnaw through any defenses. Weakness: They have no social structure. If a Chief or a Shaman can display enough power to intimidate enough followers, they may be able to keep a small tribe in line for a while, but this will inevitably break down. Goblins are irritable and violent, as if the entire species has just quit smoking. Strength: They can be rallied. When given an inspirational leader or a fearsome overlord, Goblins can be rallied to complete a single, simple task to the best of their communal ability. Weakness: Goblins are fantastically stupid. Your typical example has no ability to predict the outcome of an unfamiliar situation. Strength: They are wily and obsessive. Their ability to think outside the box is unparalleled. This best shines through in any tinkering or engineering that they do. 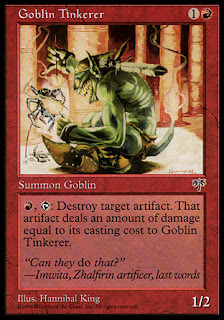 Goblin creations are dangerous and flawed, but will usually do what they were designed to, if only once. But most of all, they're fun. They never get bogged down in things like image, politics, religion, or personal safety. They are the ultimate expression of living in the moment. As more iterations get more popular, the public idea of Goblins begins to solidify. 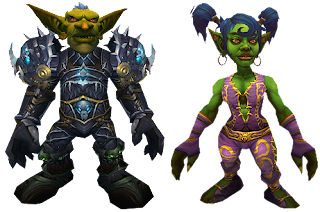 I imagine that from now on, your average nerd/gamer is going to immediately think of World of Warcraft Goblins as their standard. I don't think that there's any thing wrong with that, really. They're a pretty well-rounded example, in my humble opinion. Anybody else have any thoughts on these little green gems? My biggest exposure is through The Lord of the Rings. They seemed like dangerous creatures to me! You're right, Lord of the Rings Goblins are pretty tough. As far as I know, they are the nastiest ones around.